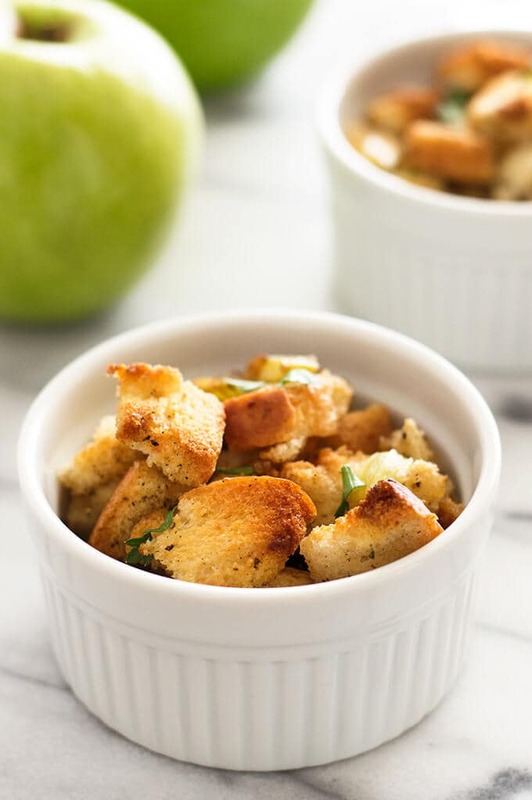 Easy apple stuffing with crispy, buttery bread bread, celery, and tart apples. A perfect simple side dish for two. Growing up, we ate stuffing one time per year in my house. That time was Thanksgiving. The stuffing came out of a box. It was fine. It wasn’t until I got older that I realized 1) stuffing is carboliciously amazing. And 2) good stuffing is suuuuuuuper easy to make. Like ridiculously easy. Cut some bread, cut some veggies, simmer in butter, add seasoning, bake. Done and delicious. 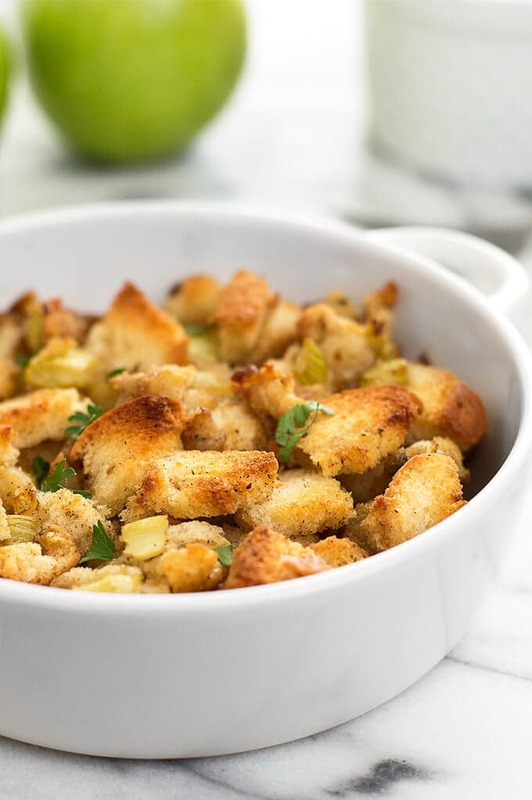 If you have a protein that’s feeling a little lack luster, adding a side of Easy Apple Stuffing instantly adds polish and completeness to your meal! It’s also super scalable, so you can scale it up or down depending on how many servings you need.Today’s recipe is Easy Apple Stuffing for Two, but I’ve made it for one, and when I roast a chicken, I use this exact same recipe (and a full loaf of bread) to make enough for 10. This stuffing is one of my fall faves, and the fact that it takes almost zero effort to toss together is the best. Most of the time involved in the making process is just oven time, so active cooking and prep time is about 8 minutes. Not bad for something that tastes this good. The stuffing comes out buttery and crispy, with the crunch of celery and hint of tart sweetness from the apple. It goes fantastically well with chicken and pork recipes (if I make my Quick Rosemary Pork Chops on the weekend, I always include this stuffing) and it’s going to make you look so good! You can use any apple you like, but I think the tart/sweet of Granny Smith apples gives you the best flavor. If you don’t have poultry seasoning on hand, you can mix up your own, and if you don’t have all the ingredients that recipe calls for, sage and thyme are the most important flavors you want to include. Don’t like a little sweet in your savory? Just omit the apples completely. 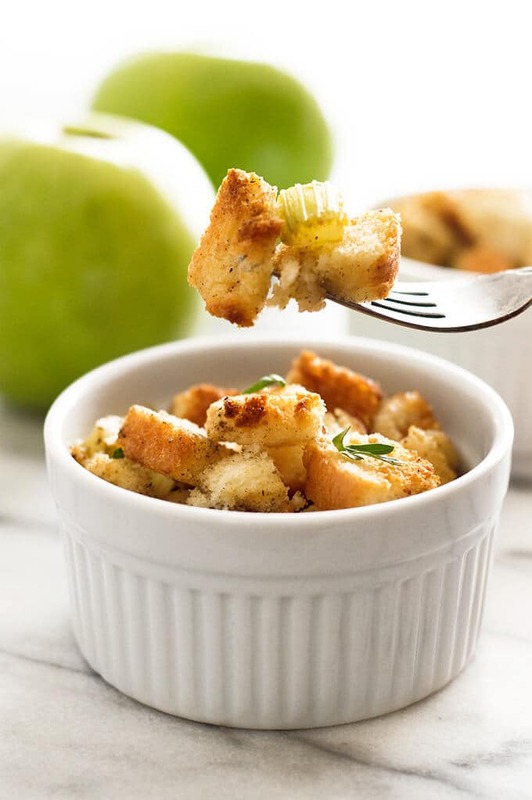 Easy Apple Stuffing is still delicious without apples. Preheat your oven to 375°F and lightly grease a small baking dish (5x7 is a good size if making the recipe as written). In a medium saucepan, melt butter over medium heat. Add onion, diced apple, and celery. Cook until softened, 4 to 6 minutes. Stir in poultry seasoning, salt, and pepper. Mix in bread cubes. Pour chicken broth over the top, and stir to coat. Transfer mixture to prepared baking dish and bake for 15 to 20 minutes, or until top of the stuffing is toasted and crunchy. *If your bread is still fresh and soft, preheat the oven to 200°F and place slices directly on the racks. Let sit in the oven while you cut your veggies, up to 10 minutes (check on them occasionally so you don't wind up with toast). What’s better then stuffing? This sounds interesting, especially with the addition of apples. I would have to double this. 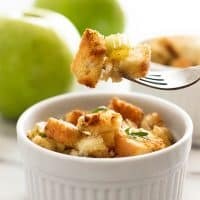 But great to know if there is ever a night just my hubs and me..
I’ve never tried apple stuffing, but I love this recipe! It looks so simple to make. Thanks, Karyl. It really is!! This was delicious! I made it with Fuji apples… perfect with pork chops! So happy to hear this, Barbara! Thanks for reporting back! If you sauted a little seasoned pork sausage and added that along with it’s grease instead of the butter, then you’d have stuffing like my mother used to make. I miss it. Mmmmm, that sounds divine. I think I need to try that next time!